The Hamleys Train is an ideal activity for those who want to shop at the V&A Waterfront with their kids. The train runs outside the Waterfront buildings, harbour-side. The station is next to an outdoor kids playground and in front of the Cape Wheel. Your kids will absolutely love it! 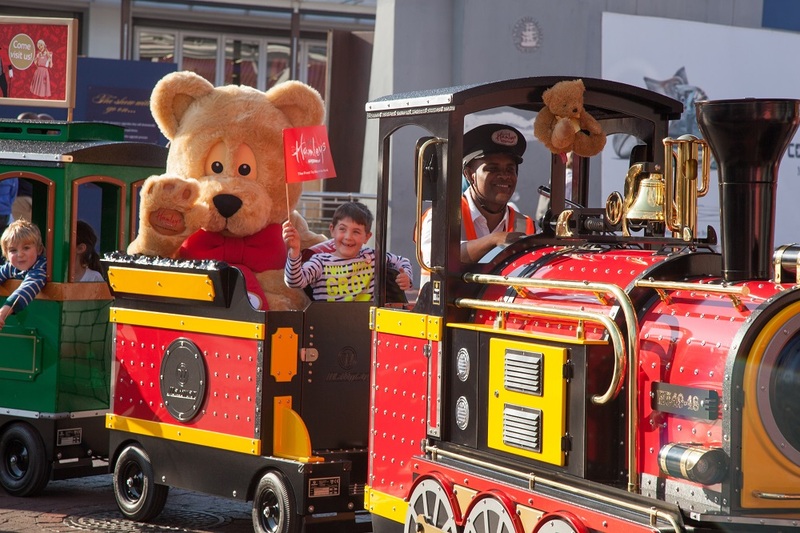 UK-based toy giant Hamleys has its flagship store in Cape Town, which boasts the first ever Hamleys Express Train. Situated at the harbour-side shopping and entertainment hub of the V&A Waterfront, the Hamleys Express Train is the ideal activity for visitors who want to shop with youngsters in tow. The train runs from its special station at the Cape Wheel and into the marketplace, giving youngsters a thrilling and exciting adventure. In the store, there’s more to entertain with a mind-boggling array of over 15,000 toys, including the iconic Hamleys Teddy Bear. In 1760, William Hamley fulfilled a dream of opening a toy shop in Cornwall, England, boasting theatres, puppets, pedal cars, miniature railway trains and a thousand other exciting toys. By 1881 a new branch opened in Regent Street in London, becoming a landmark in the UK. Today, Hamleys continues its legacy, and although the toys have changed, it’s still considered to be one of the best toy shops in the world. For updates on whether the weather will affect the train, check the times listed on the sign by the station, which is updated every day. After completing a ride on the Hamleys Express, fill in the form on the back of the ticket and go in-store to claim a free Hamleys Badge. You can also enter for the lucky draw to win a Hamleys Hamper. If you book a train ride for the weekend, bring the kids to meet the famous Hamley and Hattie Bears, who love to pose for photos and selfies while dishing out high fives to enthusiastic kiddies. At the ripe old age of 255, Hamleys is the oldest toy shop in the world. The store was originally called Noah’s Ark, but was renamed Hamleys in honour of its founder. At the UK’s Regent Street branch, a bus stop in front of the store was created entirely out of lego bricks. The bus stop was launched in 2014 to mark the Transport for London (TfL) Year of the Bus.